Nissan's thoroughbred sports car offers an impressive combination of finesse and brute force, just like a Stealthbox®. For the 370Z, the JL Audio design team arrived at a solution housing twin 10W3v3 subwoofer in a sealed enclosure that mounts ahead of the rear axle, so as to preserve precious cargo space and maintain the car's excellent weight distribution. The enclosure is carefully form fitted to the space to extract maximum useful volume and blends beautifully with the Z's interior panels. With up to 1000W of power handling, this Stealthbox® will transform your Z into a serious music playback machine that will add enjoyment to every minute you spend on the road. 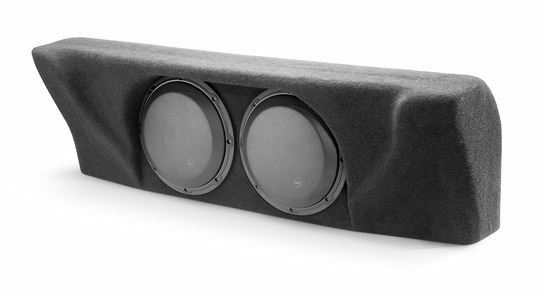 The Hard Data: Contains two 10W3v3-4 subwoofers in a sealed enclosure. 1000 watt power handling. Wired for 2 ohm mono. Installs behind front seats in the forward section of the cargo area. Steel mesh grilles are included to protect the subwoofer drivers. Will not fit the 370Z convertible model.